← Does Art enhance creativity through motivation? The flow theory of Mihaly Csikszentmihalyi (1975) that I wrote about in my last blog is one element to explain how motivation evolves in arts and which has a lot alike with mindfulness. When somebody experiences the flow he is fully engaged into the task with the purpose of the task lying in itself. It is about a balance between demands and ability. Balance is also central in mindfulness. Mindful moments are moments where you have the feeling of full control like in a “flow”. Worries are “blown away”, what counts is the moment, not the past or the future. This “effortlessness” also characterizes flow. Time does not really matter, the act and the consciousness merge. As you see there are many parallels between flow and mindfulness and I think mindfulness is substantial in arts as it is in meditation and music. One major difference though is that flow comes spontaneously in an activity that you enjoy and that have a certain level of requirement whereas mindfulness is a state of mind that you consciously pursue. These definitions of mindfulness hopefully provide a good understanding of what mindfulness means. Finally mindfulness has to be clearly distinguished from concentration. Whereas concentration is the focused attention on a certain object or object area mindfulness has the exactly opposite orientation. The focus is not purposeful narrowed on something but rather broadened. In its perfection the attention consists of an all-embracing, clear and wide awake openness for the total wealth of perception. As you see mindfulness is a broad field and Grossman (2008) indicated that mindfulness is difficult to define, even more to operationalize. Hick (2009) even shows scepticism of being able to define it. I approve of that and think that mindfulness and flow are closely related and only difficult to distinguish. Now that I have elaborated the meaning of mindfulness I want to focus on arts again and bring the two aspects, mindfulness and art, together. Curry and Kasser found out that coloring mandalas leads to a reduction of anxiety (2005). They randomly divided 84 undergraduate students assigning them to color in a mandala, a plaid form or a blank sheet. Mandala- and plaid-coloring groups experienced a reduction in anxiety compared to the blank sheet condition. Therefore they inferred that structured coloring with a reasonable complex pattern may induce a meditative state that helps to reduce anxiety. Art thereafter is not only a tool helpful in education but also in therapy. But it can also be combined and help students with fears and worries focus and organize their “inner chaos”. Grossman (1981) stated that it helps people to give sense to the flood of information in their daily lives. It also helps to express you without having the struggle to find the right words. Kabat-Zinn et al. (1992) proofed the effectiveness of mindfulness meditation for anxiety reduction. Brown and Ryan (2003) confirmed the positive effects of cultivating “mindfulness”. Art is one way to practice mindfulness. Semple et al. demonstrated that mindfulness reduces attention and behaviour problems which are important for students in school who have difficulties focusing on class and distract others by oppositional behaviour (2010). Art as an instrument of practicing the skills of mindfulness are in fact a great way to reduce these problems, and improve not only the achievement of the child directly confronted with these problems, but also the performance of class mates. Mindfulness training also has been shown to be effective in school-based programs to reduce stress (Napoli, 2005; Wall, 2005). Finally, I want to deliver a little insight into how art could be used to convey the concept of mindfulness to children. Diana Coholic (2011) found out that children in need can profit from an art-based approach to mindfulness that enhances creativity. It improves their self-awareness, self-esteem and resilience. I think that this approach could also lead to similar results in a school setting. In one activity called “Jar of thought” the children dropped various coloured beads into two different glass jars which were half filled with water representing objects and feelings. Then children chose to either shake the jar or not regarding to which mind it represented. One jar stood for a mindful and self-aware mind, the other for a full, busy and unfocused mind. Building up on that task the children elaborated how well a mind under these different circumstances can work. A different activity centered on feelings, as it is crucial to be aware of them, tolerate and comprehend them to act mindful. In a big circle the children drew different shapes of feelings, used colours, words and images with bigger symbols representing particular feelings which are more dominant throughout the day. With lots of creativity they thus drew a picture of their own mind which served as the basis to reflect about the different levels of impact that feelings have. Then these children had to come up with own ideas how to for example achieve that “happiness” plays a greater role in their lives. These ideas and the findings stated above demonstrate the importance of art in school curricula and I plead to enhance the focus on it and to teach art with methods of mindfulness. There are so many good features about art, when do we get moving and start to implement what we have found out a long time ago? Brown, K. W., & Ryan, R. M. (2003). 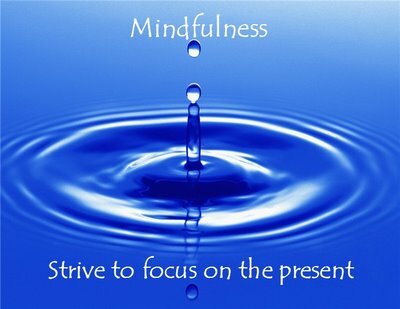 The benefits of being present: Mindfulness and its role in psychological well-being. Journal of Personality & Social Psychology, 84(4), 822-848. Coholic, D. (2010). Arts activities for children and young people in need: Helping children to develop mindfulness, spiritual awareness and self-esteem. London, UK: Jessica Kingsley Publishers. Grossman, F. G. (1981). Creativity as a means of coping with anxiety. Arts in Psychotherapy, 8(3/4), 185-192. Grossman, P. (2008). On measuring mindfulness in psychosomatic and psychological research. Journal of Psychosomatic Research, 64(4), 405–408. Hick, S. (Ed.). (2009). Mindfulness and social work. Chicago, IL: Lyceum Books Inc.
Kabat-Zinn, J., Massion, A. O., Kristeller, J., Peterson, L. G., Fletcher, K. E., Pbert, L., et. al. (1992). Effectiveness of a meditation-based stress reduction program in the treatment of anxiety disorders. American Journal of Psychiatry, 149(7), 936-943. Napoli, M. (2005). Mindfulness training for elementary school students: The attention academy. Journal of Applied School Psychology, 21(1), 99–125. Semple, R., Lee, J., Rosa, D., & Miller, L. (2010). A randomized trial of mindfulness-based cognitive therapy for children: Promoting mindful attention to enhance social-emotional resiliency in children. Journal of Child and Family Studies, 19, 218–229. Wall, R. B. (2005). Tai chi and mindfulness-based stress reduction in a Boston public middle school. Journal of Pediatric Health Care, 19(4), 230–237. This entry was posted in Uncategorized and tagged Art, Kabat-Zinn, Meditation, Mihaly Csikszentmihalyi, Mindfulness. Bookmark the permalink.